Marine Le Pen has proposed changing the name of the Front National to Rassemblement National - loosely translated as National Rally - as part of a makeover aimed at ridding the French far-right party of its racism-tinted past and getting it ready to take power. 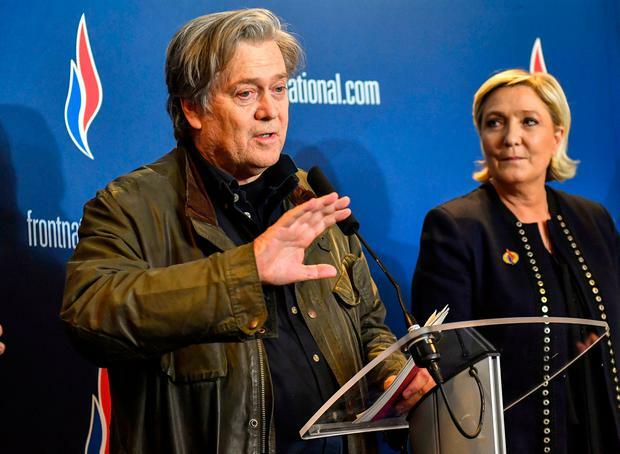 She made the proposal at a party conference where members voted to sever ties with her father, Jean-Marie Le Pen, the firebrand founder of the movement who has a long history of making racist and anti-Semitic remarks. But on the same day that Ms Le Pen, who took over 10 million votes last year in her failed bid for the French presidency, spoke of a bright new future for the FN, her party had to suspend a senior official after he was caught making a racist insult. Ms Le Pen (49) said the FN's current name was "associated with a glorious and epic history that no one can deny" but she said it was also an impediment that prevented the Eurosceptic and anti-immigration party winning power in elections. The new name must now be approved by party members in a mail vote. The possible change is part of a broader makeover - aimed at "de-demonising' the party. She won a major boost on Saturday when Steve Bannon - the man who helped Donald Trump ride a populist wave to power in the US - made a speech at the conference. He praised Ms Le Pen's vision of a political spectrum that no longer spans left-right but pits "nationalists" against "globalists".